FILE - U.S. President Barack Obama (L) shakes hands with China's President Xi Jinping in front of U.S. and Chinese national flags during a joint news conference at the Great Hall of the People in Beijing Nov. 12, 2014. Visit comes at time of growing flashpoints between the two countries: on cyber security, territorial disputes, China's currency. Chinese President Xi Jinping's trip to the United States this week is perhaps his most important since coming to power. China's state media and officials have portrayed the visit as an opportunity to build trust. The trip comes at a time of growing flashpoints between the two countries: on cybersecurity, territorial disputes and China's currency. But despite the attention analysts are giving the visit and its weighty agenda, on the streets in Beijing only a few say they will be following the trip closely. Two young saleswomen that VOA spoke with in Beijing's trendy Sanlitun district had more views about their iPhones and U.S. television dramas than President Xi Jinping's trip. "We don't pay that much attention to national affairs," one woman replied. The two said that they were more interested in pop-culture than politics. Pei and her friend Wu, who recently arrived in Beijing to participate in a job training course, said they did not even know that President Xi was traveling to the United States. "We just came to Beijing recently from out of town for training and have had little time for anything else," Pei said. Those who did know Xi was going knew little about what was on his itinerary. Zhang, a worker in the telecommunications industry, said he did not know where Xi was going, what big events were coming up during the trip or when he would return. "I don't know. Is this really something that I should be concerned about?" he asked. 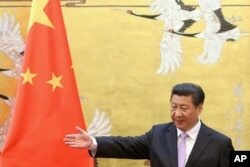 Although some knew little about Xi's plans, there is clearly concern about the current state of relations between the two countries, one a rising global power and the world's second largest economy, the other the world's largest economy. "I think the United States is not happy with China's rise because it wants to keep being the big man on the block," said Guo Zhongde, an elderly Beijing resident. Chatting about China as she fed her grandson, one elderly grandmother, who wished to remain anonymous, said there was nothing wrong with the rise of other countries such as China. "Everyone wants their country to become more powerful," she said. "You can't always be the big man on the block. There will always be someone trying to overtake you." Analysts say at a time of growing flashpoints between the two nations, on a wide range of issues from cyber security to territorial disputes and China's currency, there is urgency for this visit to try to repair a widening gap of mistrust. In an upbeat opinion piece on Monday in People's Daily, the mouthpiece of the Communist Party, Chinese Ambassador to the United States Cui Tiankai predicted the trip would be a milestone visit. On the streets in Beijing, what could come next was less certain. One young mother, Jiang Shu, was not that optimistic about the current trend of ties between the two countries. "Sooner or later there will be conflicts, and that includes possibly over the United States support for Japan or Taiwan," Jiang said. What is clear is that as the relationship becomes increasingly complex, defining it has also become more challenging as well. And perhaps that is why some, such as Zhang, said he was more interested in following his favorite basketball team, the Los Angeles Lakers, and watching House of Cards than discerning which way relations between China and the United States are trending. "The relationship is not as black and white as it used to be," Zhang said. "It depends on the issue that you're talking about. It's not a simple question of whether the United States is good or bad." VOA Mandarin Service Reporter Fred Wang contributed to this report.